The fortieth birthday is always very special. But you know, some of us (women) don't like that number and don't want to be reminded of it. After thinking about this beautiful young woman and the word "forty" I realized something. Throughout her life she has acquired many fortes. 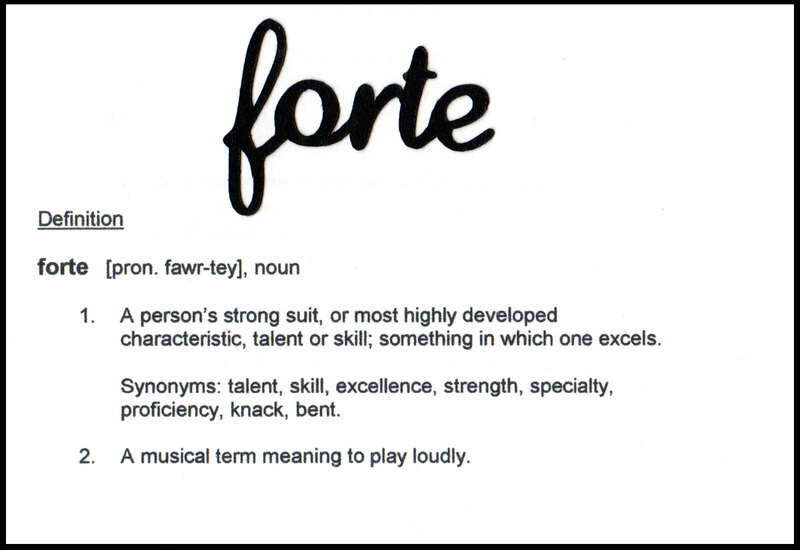 So I wrote a special poem and designed this card around the word "Forte" which not only means "special accomplishment" or "strength" but in musical terms, it means "loud". The musical definition is what inspired the music background and gemstone notes. The overall card size is 5-1/2" square. The colour scheme is elegant -- black base with white frame and background. The real hit of colour and star of the show is the turquoise foil sentiment in its oval frame. 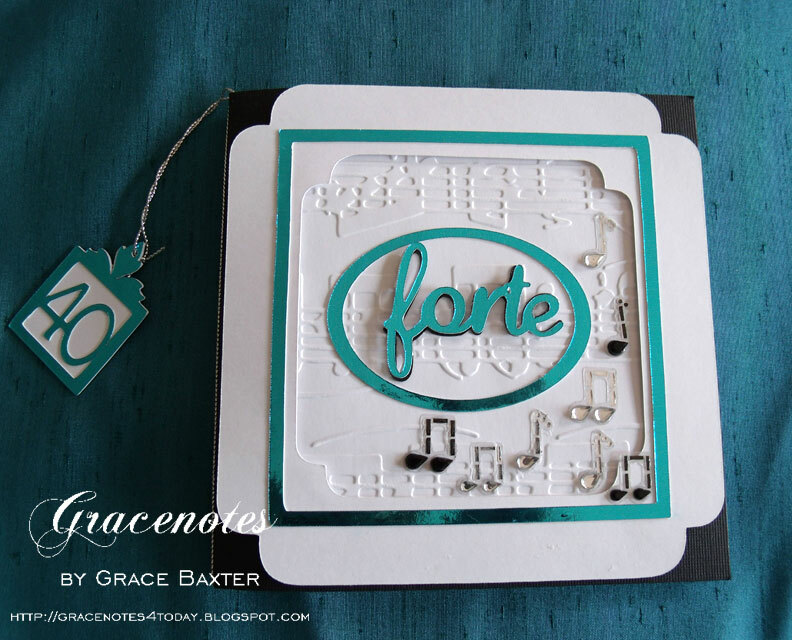 Another narrow frame of the same turquoise foil draws you in. I wanted the number 40 to appear somewhere but in a very discreet and special way. So I made the dangling charm and attached it with silver cord that acts as a bookmark for the card. The finale is the collection of scattered gemstone notes in black and silver. The card is designed as a booklet. Inside the front cover, I have created a page for the definition of the word "forte". The poem is entitled Your Forte which is more than just a play on words. It totally describes the recipient of this card. I used my Gypsy for much of this card. The frames had to be sized just right and I found that they could not be perfectly square, even though the card itself IS. The measurements on the Gypsy were always slightly off in order for it to work. 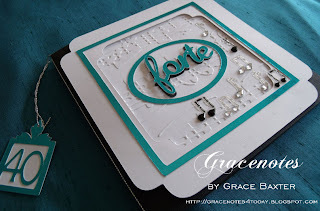 This special 40th birthday card was a lot of fun to make, and it is TOTALLY "her". 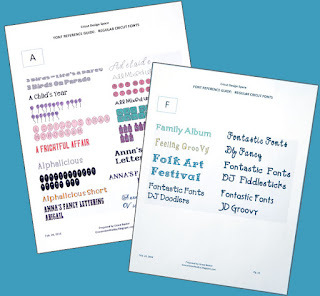 Quarter Note - Font for "forte"
What a wonderful blog! Your cards and creations are beautiful! Thank you for visiting my blog and becoming a member! Sooo...a woman might like to see the insert hat didn't make it inside her card! 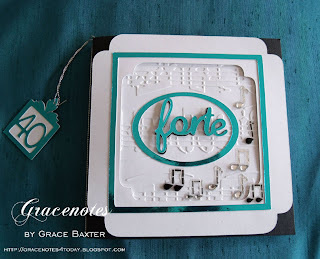 You mentioned there was an extra printed piece...I'd love to have that to complete my gorgeous card!